1985-07-05. New. Ships with Tracking Number! INTERNATIONAL WORLDWIDE Shipping available. Buy with confidence, excellent customer service! 1988-05-09. New. Ships with Tracking Number! INTERNATIONAL WORLDWIDE Shipping available. Buy with confidence, excellent customer service! Villard, 1988-03-12. Revised. Paperback. Used:Good. Villard. PAPERBACK. 0394758056 New Condition. . New. Villard. Hardcover. 0394537130 New Condition. . New. 1985-07-05. Good. Ships with Tracking Number! INTERNATIONAL WORLDWIDE Shipping available. May not contain Access Codes or Supplements. May be ex-library. Shipping & Handling by region. Buy with confidence, excellent customer service! Villard. PAPERBACK. 0394758056 New: Packaged Carefully & Shipped Promptly. 100% Satisfaction Guaranteed! . New. 1988-05-09. Good. Ships with Tracking Number! INTERNATIONAL WORLDWIDE Shipping available. May not contain Access Codes or Supplements. May be ex-library. Shipping & Handling by region. Buy with confidence, excellent customer service! Villard. Hardcover. 0394537130 Like New Condition. . Fine. Villard. PAPERBACK. 0394758056 Like New Condition. . Fine. Villard. PAPERBACK. 0394758056 2nd printing. Very good. books carefully packed and shipped promptly . Very Good. Villard, December 1985. Hardcover . 8.5 Bulk HB Premium. Villard, 1985-12-12. Hardcover. Like New. Villard, 1985-12-12. Hardcover. Very Good. Villard Books, 1988. VG+. Oversized Softcover. Revised edition. 723 pp..
New York: Villard Books. Paperback. 1988. Revised Ed. Large 8vo 723pp . Very Good with no DJ. Trade PB. Spine lightly creased . Free Press. Very Good+ with No dust jacket as issued. 2001. First Edition. Softcover. 9780743227223 . A crips clean tight perfect bound softcover copy showing light shelf and edge wear only. .
New York: Villard Books. 1986. First Edition. Hardcover. 1884064574 . Very Good with no dust jacket; Edgewear. 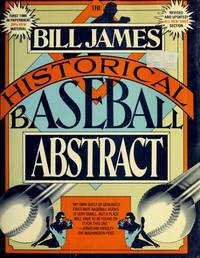 ; Traces baseball's history, rates the best players of all time, and looks at how the sport has changed. ; B&W Illustrations; 721 pages . Villard, 1985-12-12. Hardcover. Good. Hardback with dust jacket in good condition. Some light fraying on the dust jacket. Red marker mark on the bottom edge.Some faint discoloration on the top edge. Binding not tight on the spine at the top edge. RANDOM HOUSE. GOOD COCKED. TRADE PAPERBACK. Villard. Used - Good. Ships from the UK. Shows some signs of wear, and may have some markings on the inside. 100% Money Back Guarantee. Your purchase also supports literacy charities. Villard. Used - Good. Shows some signs of wear, and may have some markings on the inside. Villard. Used - Good. Ships from Reno, NV. Former Library book. Shows some signs of wear, and may have some markings on the inside. 100% Money Back Guarantee. Shipped to over one million happy customers. Your purchase benefits world literacy! Villard. Used - Acceptable. Former Library book. Shows definite wear, and perhaps considerable marking on inside. Villard. Used - Good. Former Library book. Shows some signs of wear, and may have some markings on the inside. Villard. Used - Good. Good condition. Good dust jacket. Villard. Used - Good. Good condition. Slightly dampstained. Villard. PAPERBACK. 0394758056 Book is very clean. Crisp pages. Tight binding. Creased cover. Light shelf wear on cover. Dented corners. Sun fading. . Very Good. Villard. PAPERBACK. 0394758056 FAST SHIPPING!! No CD Included. Access code may be previously used. Heavy wear, wrinkling, creasing or tears on cover and spine. Heavy writing and highlighting. Cover has used book stickers or residue. Marker on cover or bottom edge of book. Book may have additional damage or defects not listed above. . Fair. Villard. PAPERBACK. 0394758056 Some wear, but still a good reading copy. A portion of your purchase of this book will be donated to non-profit organizations. Over 1,000,000 satisfied customers since 1997! We ship daily M-F. Choose expedited shipping (if available) for much faster delivery. Delivery confirmation on all US orders. . Good. 1988/04/01. Villard. Hardcover. 0394537130 Missing dust jacket. Acceptable Condition. Five star seller - Buy with confidence! . Fair. Villard. Paperback. GOOD. Spine creases, wear to binding and pages from reading. May contain limited notes, underlining or highlighting that does affect the text. Possible ex library copy, thatâll have the markings and stickers associated from the library. Accessories such as CD, codes, toys, may not be included. Villard. Hardcover. POOR. Noticeably used book. Heavy wear to cover. Pages contain marginal notes, underlining, and or highlighting. Possible ex library copy, with all the markings/stickers of that library. Accessories such as CD, codes, toys, and dust jackets may not be included.